Shifters STI Dual Control – With lightweight uni-directional carbon levers, superior ergonomics and proven Shimano reliability, the new Dura-Ace STI levers deliver Pro Tour precision at your fingertips. Rear Derailleurs – Strong, sleek and innovative, the new Dura-Ace 7900 rear derailleur features Carbon Composite upgrades and is compatible with wide gear ratios. Front Derailleurs – The Dura-Ace front derailleur continues to improve shifting efficiency by utilizing a stiffer and solid wide link design and trimless technology. Cranksets – This sleek aerodynamic Dura-Ace Hollowtech II crankset features significant weight saving and increased rigidity through the use of a 20% stiffer chainring, resulting in optimal shifting & power transfer. Bottom Bracket – The Dura-Ace Hollowtech II bottom bracket offers a wider bearing space for superior stability and an improved seal design for longer durability. Brakes – The Dura-Ace 7900 brakes present a new, durable shoe compound that produces 210% the stopping power in wet condition, 120% in dry conditions and 50% longer wear. Cassette Sprockets – Featuring four titanium cogs, the new Dura-Ace 7900 cogset has further improved shifting quality by creating a more rigid aluminum carrier unit along with a re-engineered tooth profile. Shimano also successfully reduced the weight of the rear wheel assembly by 10 grams. Chain – The asymmetric design of the 10-speed Dura-Ace chain improves shifting precision and smoothness due to different inner and outer plate chamfers and dimensions. While still saving weight without giving up strength, this chain offers higher durability, silent pedaling, and reduced chain drop even under intense pressure. 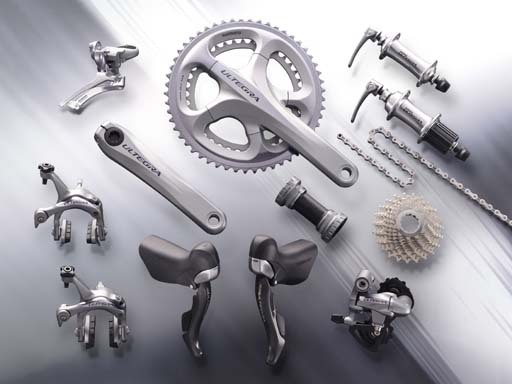 Ultegra has long been recognized as a solid performer and thanks to Shimano’s Systems Engineering approach the 6700 series continues to deliver. Lighter, more stylish and advanced by the latest Dura-Ace technologies, new Ultegra is a beautifully balanced group with optimal performance and specifications. Its unprecedented racing DNA takes shifting and braking to another level, with a with a weight reduction of 150g versus 6600 series. Shifters STI Dual Control – The new lever shape and ergonomics are a prominent feature of the new Ultegra 6700 Dual Control shift levers. Angled outward, the levers give the rider a head start on the arc of the shift with optimized hand placement, increasing comfort and efficiency. Ergonomics are further enhanced by a re-profiled perch that reduces overall reach and girth. Rear Derailleurs – New Ultegra’s striking wide-link design main body creates rigid pivots that create a foundation for precise shifts. Additionally, the new body and cage design accommodates a 28 tooth large cog so the mountain stages can be attacked with confidence. The pulley cage design allows for the use of a short cage, even with a large 33T total capacity. Front Derailleurs – The wide inner link with two anchored pivot points resists flex and moves the chain with authority. Combined with the new HollowGlide chainring, instant shifts under load require no more attention than any other shift. Cranksets – The Shimano Hollowtech II technology continues as a bench mark in the crank and bottom bracket strength to weight category. The bearings are as far apart as possible, eliminating axle flex. Efficiency is also maximized because the bearings primarily carry radial loads resulting in lower overall friction and drag. The wider stance benefits bicycle manufacturers allowing extra real estate to fortify the bottom bracket area of the frame to keep flex to a minimum. Brakes – Spindly brake calipers can’t effectively stop a speeding bike. The new Ultegra 6700 brakes not only have a rigid caliper to slow the wheel, but also a cam in the levers that provides mechanical advantage and modulation. With new pad compounds, the braking power is 20% better in the dry and has actually doubled in wet conditions. By conserving energy expended in stopping and modulating, riders can simply go faster, and longer. Cassette Sprockets – A more rigid aluminum carrier keeps the cogs in check when making shifts under load and each shift is lightning quick thanks to revised tooth profiles. The available ratios provide combinations that work particularly well when combined with compact gearing. Chain – Shifting precision and smoothness has been significantly improved through the use of different inner and outer plate chamfers and dimensions to accommodate the different shifting requirements of moving the chain inward and outward on the drivetrain. 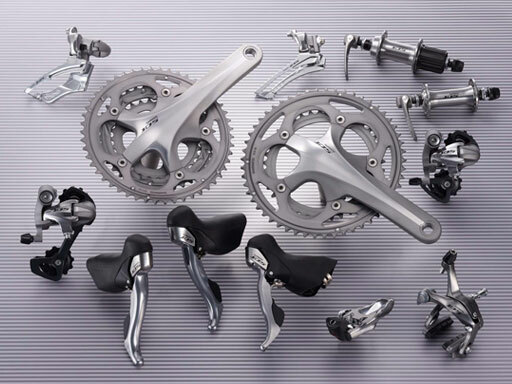 New Shimano 105 is new for 2011 and incorporates many of the benefits that were originally developed for Dura-Ace 7900 series and integrated into Ultegra 6700 series. The new group is available in Sterling Silver for a classic road cosmetic or Lodestar Black for a more contemporary look. Overall, performance and durability is enhanced while the entire group manages to drop almost 30 grams from the prior generation. Shifters STI Dual Control – New Super SLR Design relocates the brake lever pivot for better mechanical advantage. Synchronized with the new brake arch pivot a greater level of modulation and power are available from the tops of the brake hoods, where most people ride a majority of the time. Internal Cable routing gives lighter steering action and a cleaner handlebar area while fit can be customized through a series of shims creating reach adjustment. Two sizes of shims reduce reach by 5mm or 10mm for maximum comfort and control. Available in silver or black the new 105 levers are compatible with Ultegra 6700 and Dura-Ace 7900 brake arches. Rear Derailleurs – The 10 speed SIS 105 rear derailleur integrates the wide link design prominently featured in both Dura-Ace and Ultegra derailleurs to not only promote quick shifting, but to preserve the pivots for greater durability and long term crisp shifting performance. The new derailleur is available in both short and medium cage lengths for double, compact, or triple crank configurations. Front Derailleurs – The new 105 front derailleur leverages the wide inner link design introduced at the Dura-Ace lever to assertively move the chain. Combined with the improved chain guide shape, silky smooth and seamless shifts can be made even under the heaviest of loads. 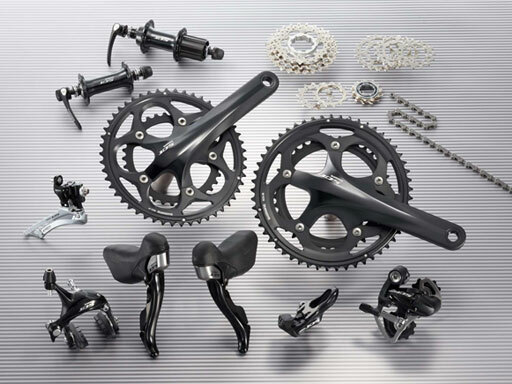 Cranksets – Shimano’s proprietary HOLLOWTECH II design provides an optimum balance of light weight and stiffness, while Dual SIS front index shifting has long been the industry benchmark for instantaneous and assertive front shifting performance. Additional improvements include increased spacing between the inner and outer chainrings to reduce chain interference in cross-chain situations. Available in double, triple, and compact chainring configurations: FC-5700: 52-39T, 53-39T / FC-5703: 50-39-30T / FC-5750: 50-34T. Brakes – New Super SLR Design relocates the brake lever pivot for better mechanical advantage. Synchronized with the new brake arch pivot a greater level of modulation and power are available from the tops of the brake hoods, where most people ride a majority of the time. Adjustable toe-in on the brake shoes allows for fine tuning braking performance while pad compounds nearly double wet weather braking performance. Available in silver or black the new 105 brakes are compatible with Ultegra 6700 Dual Control levers. Cassette Sprockets – With a light weight aluminum carrier and continued improvement of the well-recognized Hyperglide ramps, the 105 cassette shifts with a confidence and crispness that is instantly identifiable as Shimano. Chain – The asymmetrical design of the new 105 chain helps tame the most challenging shifts: inward shifts in the rear and outward shifts on the front. The unique profiling creates an extra advantage in moving the chain quietly and quickly to bigger rings and cogs even under extreme loads. What’s d price for d 105 brakes, chain n crankset fc5703? got sell the bod??? (: my name bebek..how much? How much for the Ultegra 6700 Groupset w/o installation via CASH payment..? Otherwise, what other Ceramic BBs do you guys sell? Hi ther again what is the price of 105? I’m riding polygon Helios 300. Which groupset is suitable for my bike? Thanks! Hi may i know how much is sora crankset FC-3403? Shimano sora crankset FC-3403 is retail @ $135 w installation.. Thank you! May i know when your shop starts business next week? I’ll drop by with my road bike. I need toI replace my Ultegra crank. Can i fix with Sram RED crank on Ultegra Group set. do u carry Sram cranks thanks. Bro, want to ask how much does the 105 and Ultegra shifter cost? And also the price for Sram Force shifter. Sram Force shifter, left & right @ $640 w/ installation. Hai… I’m looking for 105 set.. What is the price now.. Without hub..
105 groupset which includes shifter/brake, brake caliper for front & rear, rear derailleur, front derailleur, crank, BB, casssette, and chain is retail @ $960 w/ installation. Hi may i check with you how much is the ultegra shifter, front and rear derailleur? Hi, i’m interested in upgrading my groupset. What is the price of a complete 10 speed group set for 105, Ultegra and Dura Ace with installation? How long will the installation process takes? How much for Ultegra Cassette 11-28t with installation and SRAM X9 and X0 shifters for 10 speed. $105 for the Ultegra cassette with installation. $310 for Sram X0, and $155 for Sram X9 shifter. Hey dude, what do you mean??? 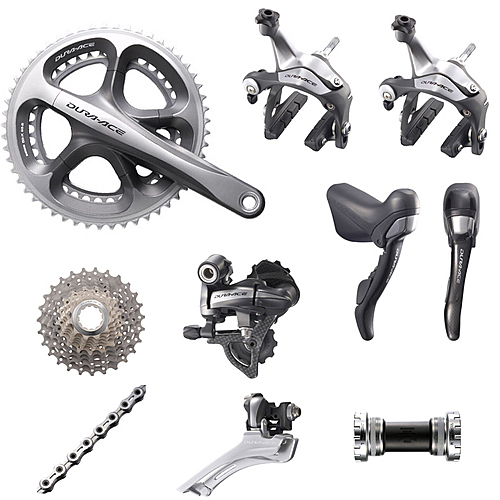 Hi, what’s the updated price for Ultegra 6700 groupset? Hi what is the best price for ultegra 6700(excl chain) + installation? Also need to re-cable entire bikes using jagwire. I’m on a Cannondale CAAD10 frame so no integrated cable housing. hi jialong does your email still work? could u please send me an email?